8:40 a.m., Feb. 17, 2014–The Association for Mathematics of Language (SIGMOL) honored the University of Delaware’s Vijay K. Shanker with the inaugural S.Y. Kuroda Prize on Jan. 7 for his work in natural language processing. The award is given for long-lasting advancements in mathematical linguistics. 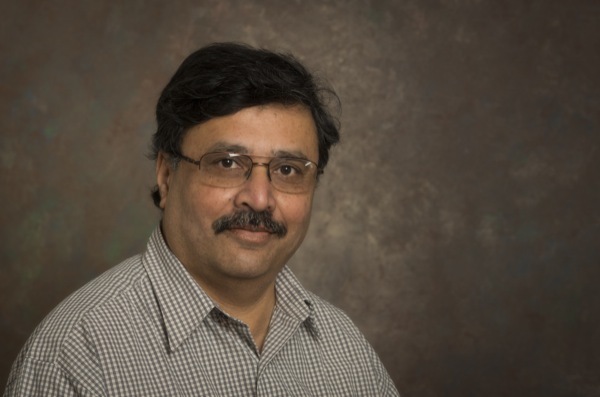 Shanker, professor in the Department of Computer and Information Sciences, was selected for his work on the convergence of mildly context-sensitive (MCS) formalisms. He shares the award with his colleagues Aravind K. Joshi of the University of Pennsylvania and David Weir of the University of Sussex. Shanker explained that grammar formalisms are tools developed by computational linguists to describe the syntax of human language. The challenge, he said, is developing grammar formalisms powerful enough to capture the intended syntax in a way that is computationally tractable, or easily solved mathematically. Many computational linguists have independently developed formalisms based on the grammatical structure and language phenomena they sought to model. Within computer science, however, these mathematical structures help professionals implement automated translation and other artificial intelligence applications. In their work, Shanker and his partners showed that a number of these formalisms were equivalent in their ability to describe languages. According to a statement on the SIGMOL website, this unifying result was considered “as unexpected as it was broadly encompassing” as these formalisms used disparate mathematical structures and operations to manipulate them. “The territory that was opened by the work of Joshi, Shanker, and Weir has fostered an enormous body of research in computational linguistics and natural language processing, and has sustained a community of researchers that goes far beyond the direct academic descendants of the three researchers whose work is now honored with this prize,” according to a statement on the SIGMOL website. While Shanker’s current work involves developing natural language processing and text mining algorithms for the bioinformatics and software engineering fields, he said it is still a privilege to be recognized for his earlier work. In addition to his faculty role at UD, Shanker serves on various program committees including the Association for Computational Linguistics and the International Conference on Parsing Technologies. Presented by the Association of Mathematics of Language, a special interest group of the Association of Computational Linguistics, the prize recognizes those whose work has sparked a broad new area of research or solved a major problem in mathematical linguistics 15 years prior to the award’s inaugural year. The award also commemorates the legacy of the late linguist professor S.Y. Kuroda whose revolutionary work characterizing the class of context-sensitive languages in terms of linear bounded automata enhanced computational linguistics research, formal language theory and theory of computation.